Smelling a ripe pineapple or mango invokes visions of warm summer days! Getting hold of a fresh ripe mango during winters is really tough. But a pineapple is still doable! I had been searching for a flavorful pineapple for last 3 weeks. So when I found one that I could tell just by taking a whiff that it was going to be sweet, I was excited 🙂 Along with just enjoying it raw, I wanted to make a few dishes with it to stretch it out. Chobani Plain Greek yogurt is a fantastic base which I use for lots of different dishes. One of my favorite ways is to add fresh fruit and nuts to enjoy it as breakfast, snack during day or even as dessert if made correctly! 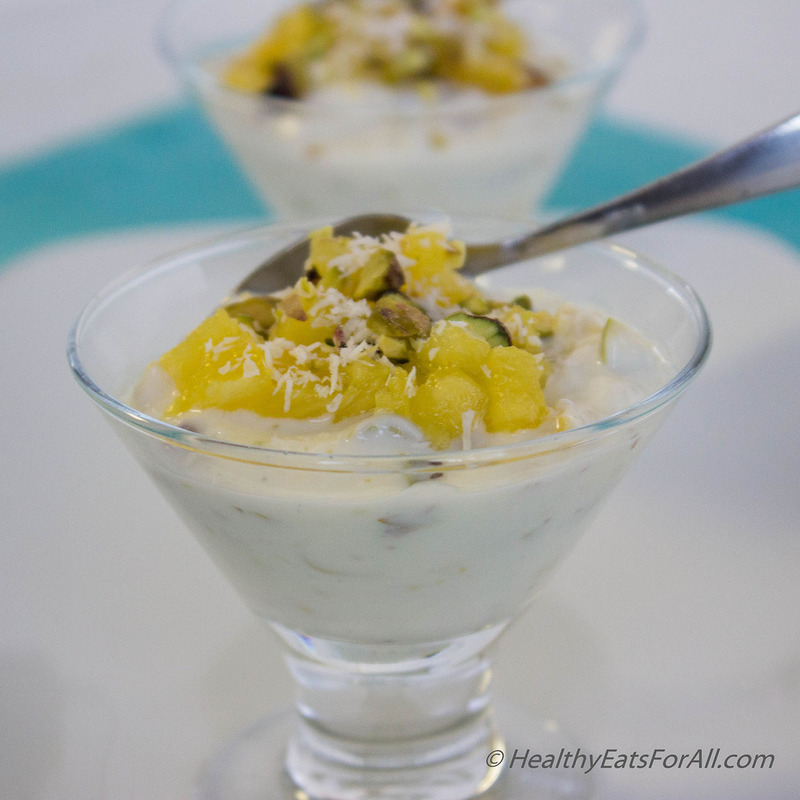 Today I am presenting a totally tropical take on plain Greek yogurt. 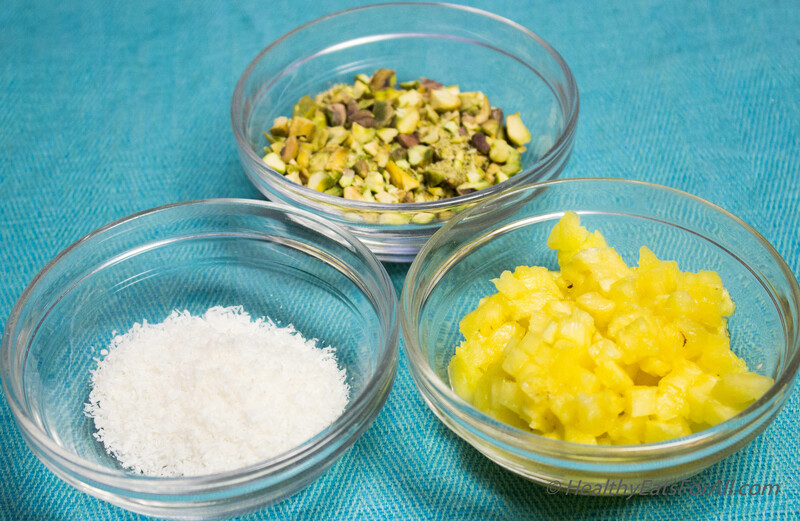 I have mixed fresh pineapple, pistachio and grated coconut to make a wonderfully tropical snack! Feel free to add a teaspoon of Honey for extra sweetness. I did not feel the need as fresh pineapple has plenty of sweetness to satisfy my sweet tooth. Super Bowl is almost here! So it seems like everyone is looking for easy appetizers and finger foods, both sweet and savory. I know there will be plenty of greasy options available but as part of the #madewithChobani #deliciousbowl campaign, I wanted to present another guilt free, healthy option for everyone. It literally takes 5-10 minutes to make and assemble! 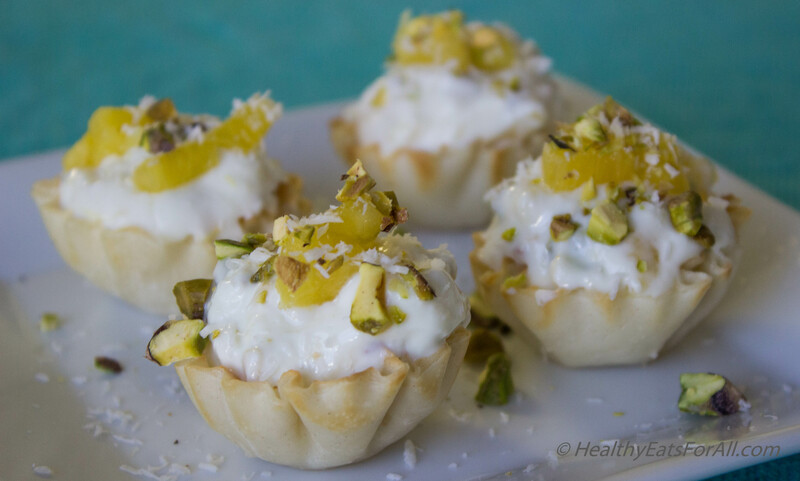 Can’t get any easier 🙂 In case you want to lower the calories or don’t have access to the pre made mini phyllo shells, just serve in small bowls or small martini glasses for extra flair! Chobani Plain Non Fat Greek Yogurt – 1 cup or 8 oz. Preheat the oven to 350o Keep the frozen phyllo cups in oven for 2-3 minutes only. In the meantime, finely mince the pineapple and pistachio. Keep a little of each on the side for garnish. 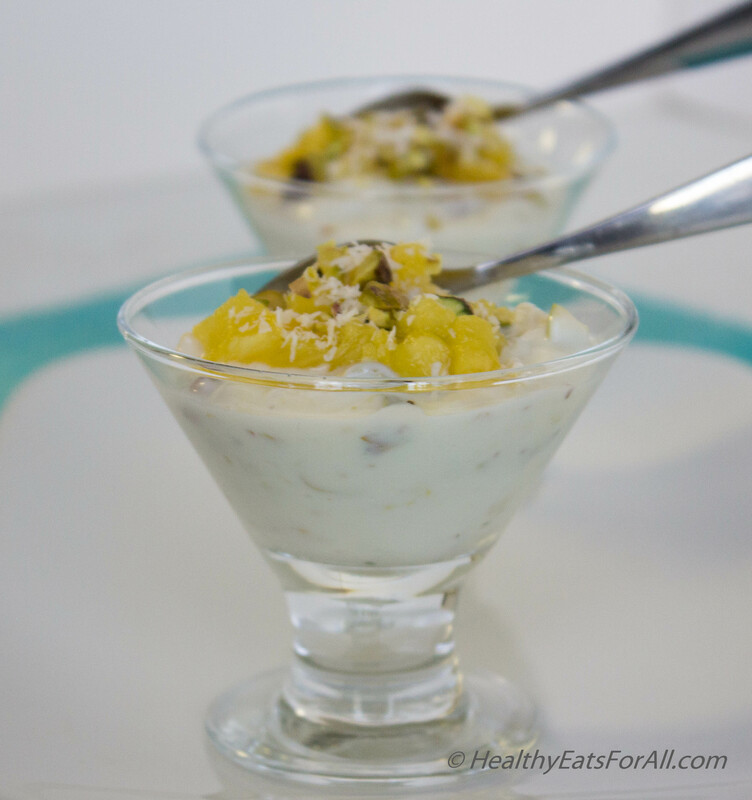 Only when ready to serve, add the pistachio, pineapple and shredded coconut to the Greek yogurt and mix well. Taste it. If it seems too sour, add the honey. Garnish with remaining pistachio, pineapple and coconut. 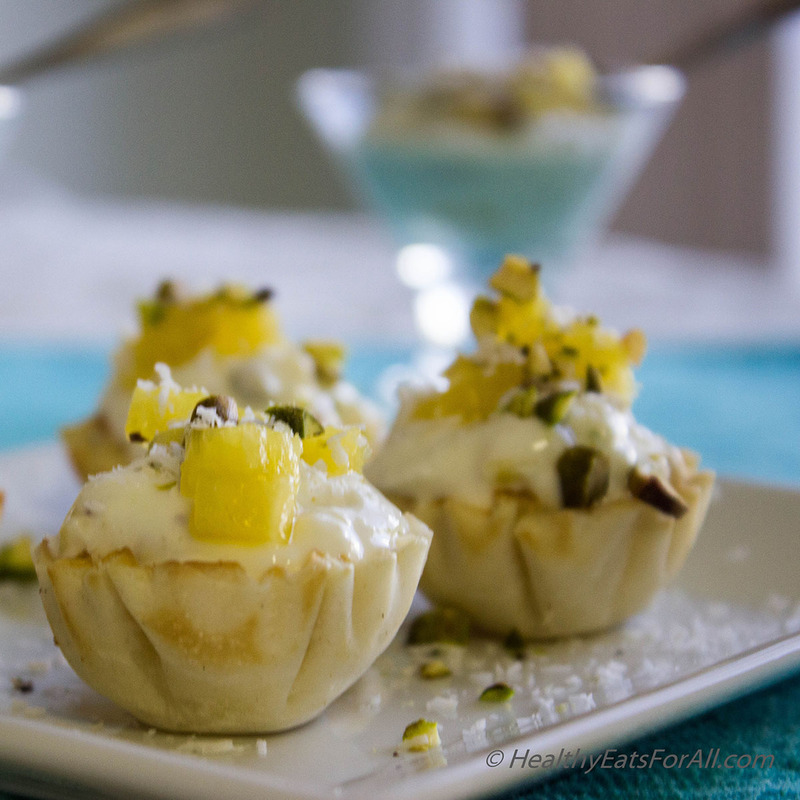 To avoid the calories of the phyllo cups, you can also serve in mini martini glasses or bowls! For additional Chobani recipes check out their Tumblr and recipe page.